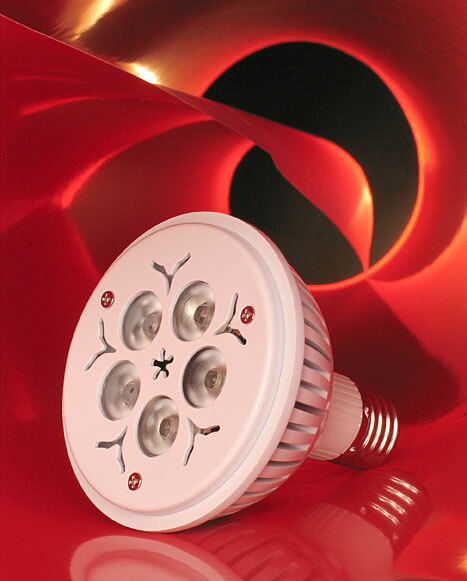 LEDtronics® announces the latest addition to its series of high-power PAR30-style LED spotlight bulbs. The white-body, medium-beam PAR30 LED bulb is made up of five 3-watt LEDs and replaces filament-based PAR30 bulbs, combining advanced Light Emitting Diode (LED) technologies, standard 26mm Edison screw-in base and light optimizing design, producing 337 lumens of vivid warm-white light. The 25-degree-beam PAR30A LED bulb runs on a voltage range of 85V to 260V AC current, and thus can be used anywhere in the world. Other voltages like 12V AC or DC are optionally available for qualifying customers. The rugged LEDtronics PAR30A-style lamp is a direct screw-in replacement for 50W to 75W PAR30 incandescent or halogen bulbs, but typically has a maximum power draw of only 8.5 Watts. With up to 85% energy savings, high shock/vibration resistance and long-lived, high-power white LEDs ?lasting up to 50,000 continuous hours ? you can see the savings quickly add up. The PAR30A LED lamp is available in 3000-Kelvin Warm White color temperature, provides about 40 lumens per watt (at 141 mA), and has a high color-rendering index of 83.